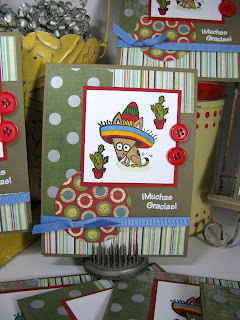 More crank 'em out cards tonite, done with an Inkadinkadoo $1.99 stamp called "Muchas Gracias"! I can't wait to see what Inkadinkadoo has up their sleeves in January at CHA, because I'm ALL over these cute little AFFORDABLE stamps! I love that they are making the images large enough that they fit on a card perfectly. I cranked these out at a get-together with friends last month. The patterned papers here are pretty much a mess of different scraps & paper lines that I had laying around. I tied the paper patterns together with the main image by coloring the little doggie & his hat in the same colors that are on the patterned papers. From what I can remember, the red polka dot paper is Crate Zoom Stoplight paper, and the green polka dot is Pink Paislee. Hope you have a blast tonite on New Year's eve! Drive safe & drink responsibly! BOY is it hard to get back into the swing of things after having vacation time off for the holiday! I went back to work today and slugged down coffee all day! I've been just dragging! 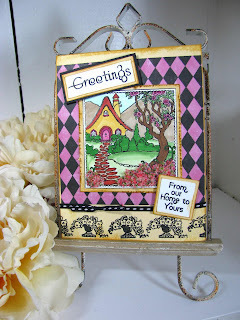 Good thing I failed to post cards from my crank-em-out weekend in St Cloud, so I have some blog posts I can do until I get back into stamping mode! 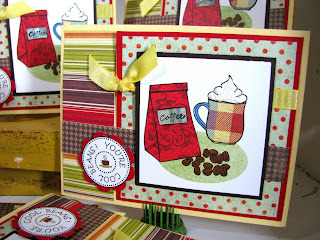 So I think these coffee cards that I did with the new Gina K "My Cuppa Joe" coffee set are SO appropriate for my day today. I needed all-occasion cards in the worst way, and these cute little office-y cards will do the trick. I can stamp any sentiment I want on the inside, because the front just says "You're cool beans"! Some of these are Thank-you cards, with the sentiment "Thanks a Latte" on the inside. I used up a bunch of old Shabby Princess polka dot paper that I had from last year's Christmas cards, so I was glad to be able to use stuff up! And this houndstooth brown paper is from AGES ago, I can't even identify it! 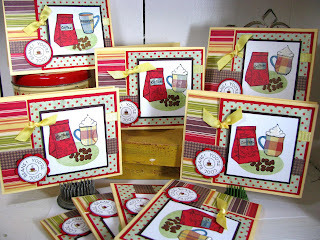 The stripe and red coffee bag patterned paper is by Scenic Route, and the mug paper is an old Daisy D's plaid. 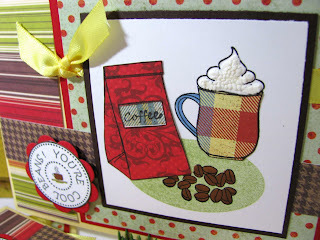 I used white liquid applique to puff up the whipped cream in the coffee. It adds a cool 3-d element to the cards! Okay, FINALLY the bingo tree! I used my pottery barn mercury glass ornaments, sparkly clip birds (also from pottery barn, clearance last year) and K & Company sparkly glitter stars from Michaels (1/2 off)! This tree was a bargain, for sure! I'm off to Wisconsin for my family Christmas celebration today. I'd like to wish everyone a peaceful, sweet Christmas, focused on family & friends. May you be blessed beyond measure. Merry Christmas! It's always so hard to choose a favorite stamp to make my Christmas cards with each year...this year I chose my Pink Persimmon "Little Christmas Cottage" stamp. I made 25 of these, and wanted something quick to stamp that would have a cozy, homey feel. I paper-pieced the roof with some burgundy polka-dot paper, stamped the trees in green, & glittered the bare branches with white glitter so they look snowy and glittery. Around the edges of the main image and in the snowflake centers, I glued Martha Stewart white-gold glitter for more sparkle! 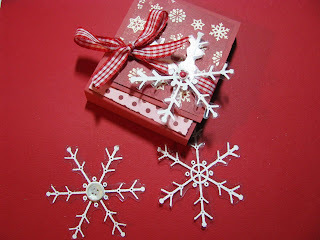 The snowflakes were punched out with a Martha Stewart snowflake punch & cream colored cardstock. For a finishing touch, inside of each snowflake I put a Mark Richards olive green gemstone. I'm guessing everyone who gets one of these cards will be covered in glitter after opening it up...there's a little bit of merry in each card that's sure to stick with the recipient long after the card is opened! HEH HEH. The glitter fairy strikes again. Here's the last of the Bean-o card ornaments. Sniff. These were so much fun to make, I'm sad that it's over! I decided that I will continue to make these little treasures for little wall or door-hangings in different themes so that I don't have to quit making them! I've had a lot of people asking where to get the bingo cards; my Mom found a box of these at a garage sale for .50 cents...little did she know that a .50 cent investment would lead to so much fun for me! Thank you Mom, these were so much fun! I've been finding sets of these cards on ebay and have purchased a few more sets to play with. When I get them in hand, I will probably split one of the sets up and offer them to you in quantities of 5 if you're interested in trying a bingo card! That way you don't have to invest in an entire set to try them out! 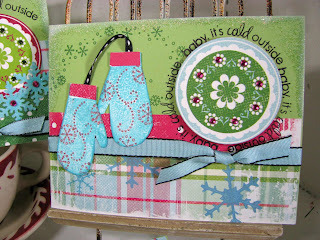 This card was made with the Crafty Secrets "Snow Much Fun" set; I used liquid applique underneath the sled for puffy snow, and some Daisy D's plaid paper for my color inspiration. 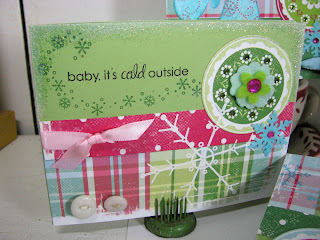 I also used Crafty's "Flourishes" swirl set. Hi everyone! I took yesterday off to finish my Dirty Dozen projects for next month so I've been hard at work creating stuff for next month's FUN theme! I haven't forgotten about the beano tree; I have one more beano ornament to post, then my xmas cards, and then I'll post the tree! I need to edit the pics, and then get them uploaded! 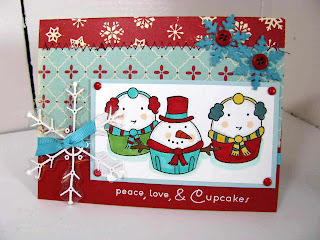 Tonite I'm back with a Taylored Expressions cupcake card; I borrowed friend Carol Halvorson's set (Thanks HB!) and had so much fun coloring in these little cupcake guys! I paired cupcakes from the "Home Sweet Home" & "Seasons Sweetings" sets up with some fun October Afternoon Christmas paper and a transparency snowflake, which I am officially calling "Piney Swapp" snowflakes. They remind me of the Heidi Swapp Ghost shapes, but I MADE them myself with Pine's (Heather Nichols) "Snowfall"Papertrey set & some heavy transparency sheets called "Crystal Clear" Cardstock from Flourishes. Tonite I have a fun tutorial for you on how to make these. I've meant to post this for a week now but had to re-do all my tutorial photos because I couldn't get good shots of the transparency snowflakes! 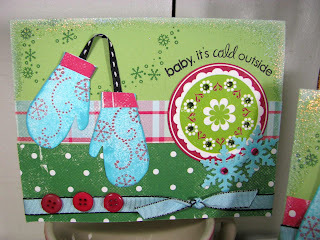 I finally discovered that they photograph better on red cardstock, so snuggle in, I'm going to show you how I made these! It makes Pine's Snowfall set even a better value, since you can create cool, custom sized transparency embellishments with the different snowflakes from this set! Rub the embossing buddy all over your transparency sheet. 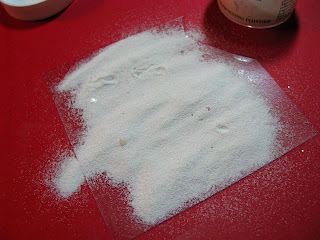 It contains a powder that will eliminate static from the transparency. 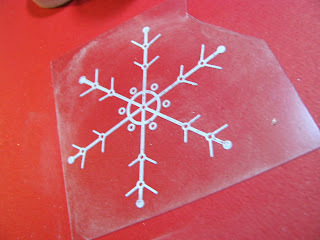 Stamp your snowflake in white pigment ink. 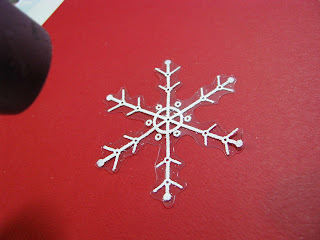 Here I chose the largest snowflake from the set. Since pigment ink is sticky and slow to dry, you can dump white embossing powder on it and it will stick to your stamped image easily. 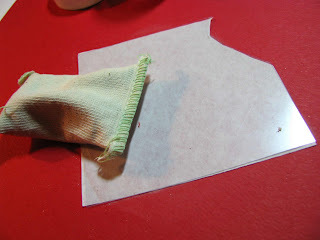 Dump the embossing powder off, and flick the back of the transparency a few times with your fingernail, to get all the excess embossing powder off the transparency. 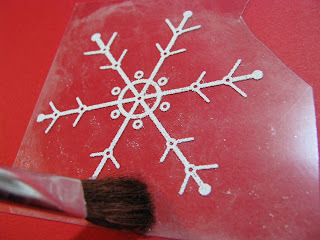 Any remaining embossing powder also be brushed away with a small paintbrush or wet q-tip. 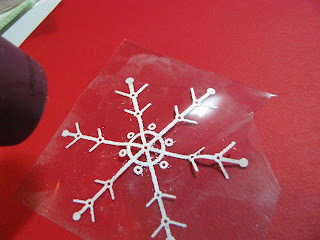 Turn on your heat gun, let it warm up a bit, and then hold it over the snowflake so that the embossing powder melts. Your transparency will curl a bit from the heat...don't panic, it's okay! We can easily fix it later. Take your scissors and cut around the snowflake points. Don't get too caught up in trimming perfectly; it won't really matter anyway. Cut quickly around the edges of the flake until it's all cut out. After you've cut the whole flake out, run your heat gun over it again quickly. The flake will flatten out nicely! 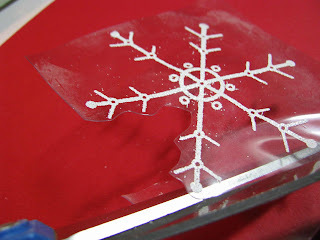 Punch holes in the transparency flake and add it to your projects! 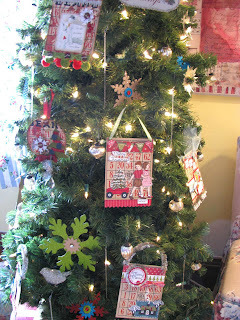 Decorate with buttons or glitter, or rhinestones, or whatever your heart desires! These are addicting to do; they add such a fun touch to your projects. I am going to make a bunch tomorrow and make Chrismas tags with them. So that's my story for tonite. It's snowing like crazy here, so I thought this was an appropriate post for today! It's a Crafty Secrets new release set tonite! 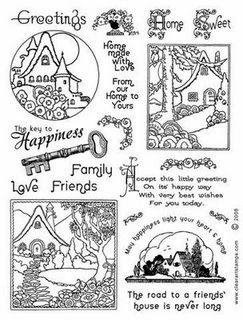 I just got the stamp set in hand and got a chance last night to play with this cute home-themed, art-deco set! NEED MORE TIME TO PLAY! And it is a FUN one to color! Oh man, you guys are gonna die when you see all the new sets that Crafty is coming out with for CHA! Just when you think they can't get any cuter, THEY DO! 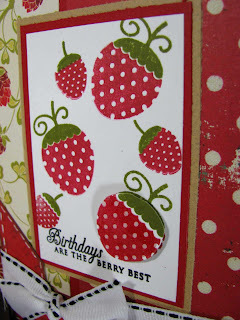 This is a super basic card layout, but I love how the magenta harlequin paper makes the stamped image POP out at you! And you're gonna kill me. I went a little nutso and have almost every color of flowersoft now. I hope you like this stuff because you're gonna see a LOT of it! And this stamp set has SO many flowers in it to put flowersoft on! 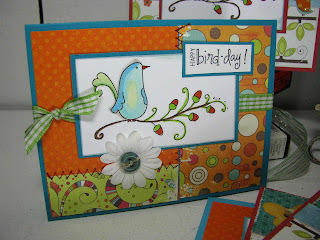 The color I used in the foreground of this card was called "Summer". It looks more purple in the photo because I colored in the flowers first with a RV34 Dark Pink Copic marker, then applied the summer-colored flowersoft to the top. 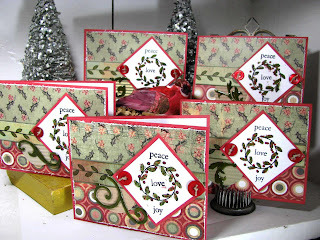 Starting Thursday (Dec. 18th), Crafty Secrets will be running a SPECIAL SALE that includes FREE stamp sets! Sandy is also doing a blog candy drawing, and will be posting more design team samples! 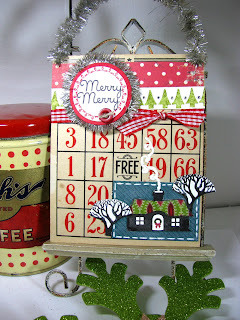 Lots of goodies if you stop by the Crafty blog HERE! 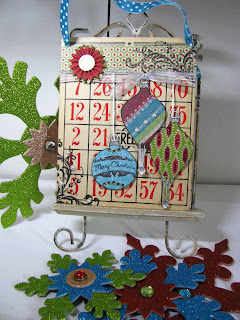 Another Bingo card for my scraproom tree today! 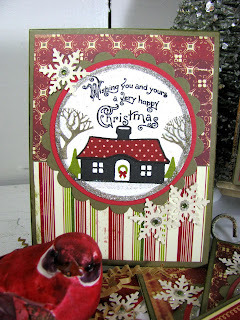 This one was done with that cute little Christmas Cottage from Pink Persimmon. I'm so sad that I'm coming to the end of my red polka dot paper from Daisy D's. I've searched everywhere for it to no avail. Sniff. I need to find a new staple for my paper collection. I swear, I use this polka dot on EVERYTHING! I even painted my bedroom and kitchen red because of this paper. I'll stop blubbering. Anyway, I stamped a little row of pine trees for a border, and then outlined the little Christmas cottage with faux-stitching with my Ranger Inkssentials White Pen. I also used white liquid applique to create the stream of puffy white smoke coming out of the house's chimney. I'm also finally making my Christmas cards with this set, as we speak! I'm glittering up a storm! Happy Tuesday! L.
Well if the dirty dozen gallery wasn't enough eye candy to look at today, OCL (Our Craft Lounge) just released 3 brand stinkin new stamp sets! 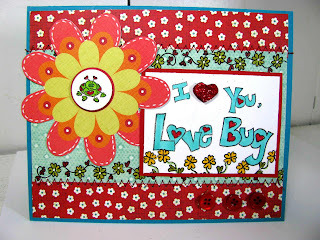 And this new "Love Bug" set has quickly become a personal fave! Do you guys remember my Mom's mushroom from our family cabin last year? Well it showed up at OCL!!!!!!!!!! I'm sure everyone has their Christmas cards done, and can start working on their valentine cards now, right? Kidding. Please don't hurl things at the screen, it won't hit me, it will just damage your computer. 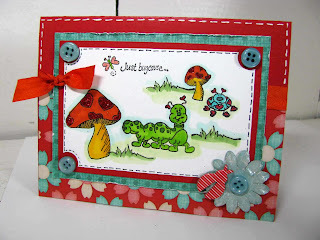 Anyway, the 3 new sets are PERFECT for V. day, including the sweet little buggies and mushies from this set! You can check out the 3 new sets HERE at OCL if you're interested! Oh hell. I gotta post this mushroom again for you to check out! (It's just so COOL!) I keep waiting to see a smurf pop out of it. Don't eat it though, it's poisonous. But the stamp sets are NOT! FREE Access to the Splitcoast Dirty Girls Gallery! Tomorrow is the 15th of the month, and that means another Dirty Dozen Gallery release happens! 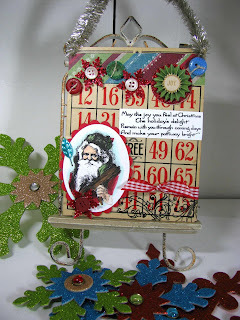 Splitcoast Stampers has a Christmas gift for everyone this month; they are allowing everyone into the Dirty Dozen gallery for FREE, even if you don't subscribe to the gallery! That means you can pop inside the gallery and see everything the Dirty Girls have been making this month for FREE! It was such a FUN FUN theme this month...at midnight, the gallery will revealed, so pop on over there for some free Christmas EYE CANDY from the Dirty Girls & Splitcoast! One of the fun things about subscribing to the Dirty Dozen Gallery, is that you can play along with the dirty girls and upload your stuff to a "Fanclub Interactive" gallery. So if the inspiration hits you, play along with us this month! 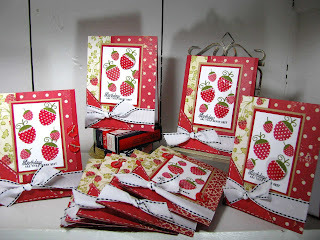 I made these Papertrey Strawberry cards for the gallery this month, but decided to upload them here instead. The theme this month is "Obscure Holidays"! Did you know there is actually a National "Pick Strawberries" Day, on May 20th? More cards from Pinefeather Press comin' atcha! 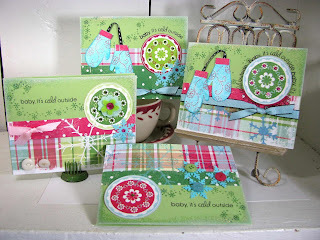 I picked up this cool pink and green plaid paper (We R Memory Keepers White Out Collection) at Archivers last weekend, and had to crank out some cards using Pine's newest release sets called Snowfall and Snowfall additions (Papertrey). I stamped the mittens in Caribbean Blue (SU) ink, and then added swirls and little patterns to the top of the mittens in pink ink. The cool circle medallions were cut out of a coordinating paper from the White Out Collection; I just added little bejeweled rhinestones (Mark Richards) for accents. 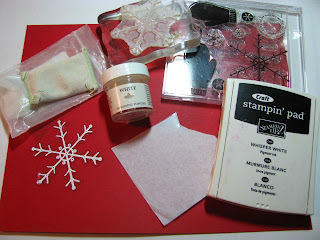 I also took blue Making Memories paints, coated the snowflake stamps & stamped snowflakes into the patterned paper. I used Holographic embossing powder and white craft ink around the edges of the cards to make them sparkle. Another fun thing I've been doing is punching out snowflakes with a Martha Stewart snowflake punch, and then adding fun flock to the snowflakes so that they are fuzzy. I need to do some fun-flocked mittens, too! So many snowflakes, so little time! It is FRIDAY and I'm ON VACATION today! YAY YAY YAAAAAAY! I'm FINISHED with my Dirty Dozen projects. FINISHED with this month's Crafty Secrets projects. So I'm taking the time today to set up a string of blog posts for the upcoming week! OOOH I feel so organized! NOT. 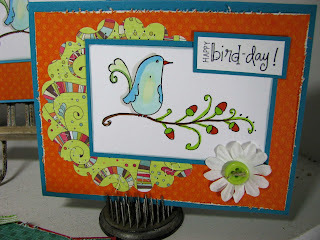 I'm calling this a PINEFEATHER weekend because I've been playing Pinefeather Press (Papertrey) lately. 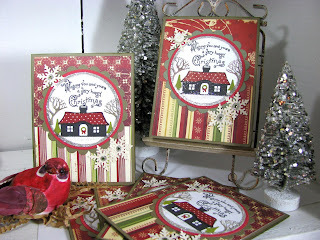 I was able to play with some of Piney's stamp sets and make some Christmas cards with them. And AGAIN I was "Flowersofting" everything! 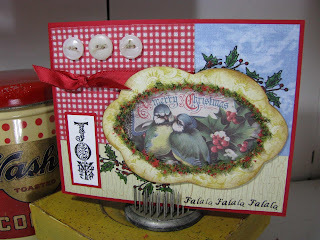 These were pretty simple cards to do...I stamped the wreath from Piney's "Rustic Branches" stamp set, then stamped red berries around the edges of the wreath. I stamped Peace, Love and Joy in between the wreath. Then I used Vintage Christmas flowersoft to fill in the leaves of the wreath, so that they are 3-d and look like greenery. I also used some of my Making Memories Chipboard swirls (Archivers $1.99 spot), colored them olive green, and used diamond glaze over the top of them to make the swirls glossy & shiny. Papers by Basic Grey "Wassail". Are you sick of bingo cards yet? I hope not, because I haven't filled my tree yet! There will be MORE! Yell uncle when you've had enough! 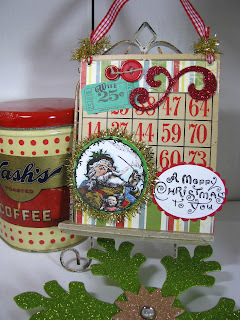 Here's another bingo card done with all of my favorite elements...a Vintage Christmas Santa (Crafty Secrets), those cool chipboard swirls from Archivers/Making Memories (glittered up with red Martha Stewart Glitter), fun tinsel-garland(Michaels), little amusement park tickets & buttons, and Daisy D's paper. OOOH GLITTERY! I'm using glitter on everything again. I stamped "Wish" on the top of the little ticket. Wishes are cheap this year! Inflation has not hit them yet! And a quick announcement tonite too...Crafty Secrets just released photos of a brand spankin new set that will be released early this year, prior to CHA! It's called Home Sweet Home, and is absolutely ADORABLE! 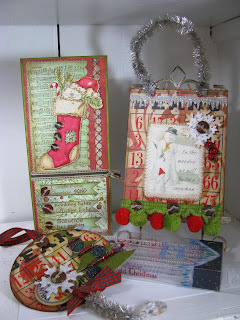 Sandy is doing a blog drawing on December 19th for this set, so make sure to check the Crafty Secrets blog for the release and the blog candy drawing HERE! Sandy and Cindy also have a free template for a triangle box for you to download! Happy Tuesday! I'm off bowling tonite but I got TONS of stuff done this weekend that I need to upload and show you! I cranked out close to 50 cards this weekend and then putzed some more at home yesterday. 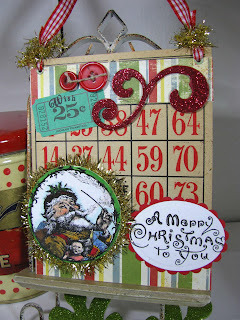 So for now I'll leave you with a quick bingo card that I made last week for my scrap room tree. 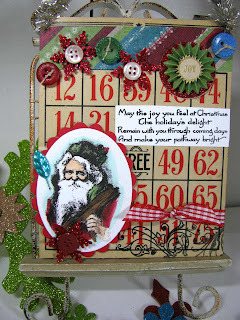 This one was done with last year's Crafty Secrets "Vintage Christmas" set. I broke down and bought a Martha Stewart snowflake punch, and have been punching out snowflakes and glittering them up with Red Martha Stewart glitter. The paper is from K & Company (Michaels), as is the round "joy" sticker. I also added some cool buttons to the top. 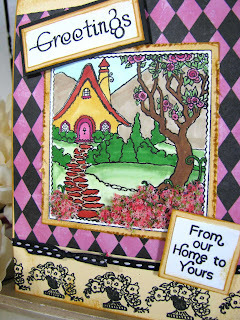 The black swirl on the bottom is also from Crafty Secrets "Flourishes" set. I can't believe how quick these are to crank out. Really it's just a strip of paper to cover the top "Beano", and then you can just add an image and embellish the top strip! So tonite my goal is to raise my bowling average. It's supposed to snow 3-5 inches so I'll be coming home to some shoveling, for sure! Are you sick of birds yet? Well at least I'm not showing Christmas cards today, right? 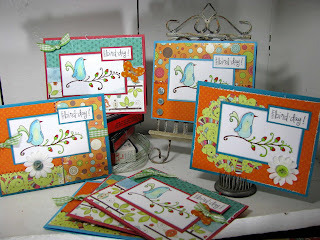 I cranked these birthday bird cards out last month at a get-together with some fun girlies that I used to work with at Archivers in Woodbury, MN. I've gotten smarter about what I bring with to a gathering. 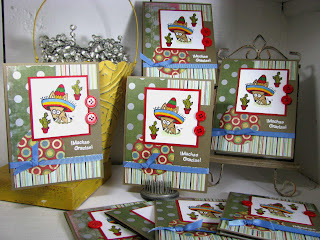 I had the card design all planned out and ready to go, and then just brought the supplies with to make a bunch of them. 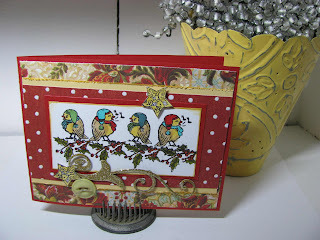 Remember that cool Unity "Birds of a Feather" set that I've been using for Christmas cards? Well this cute bird is from the same set! I've been getting so much mileage out of it. The sentiment is from A-Muse. I'm trying to use up embellishments; why do we buy all this stuff if we're not going to use it? After you use it you're sick of looking at it anyway, so USE IT UP! I've got a ton of white kaiser flowers, also, so I used up a bunch on these cards & added button centers. 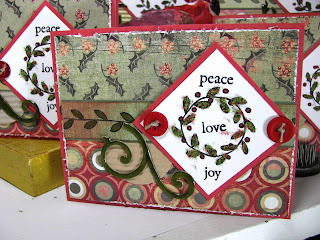 For the layout, I just used a nestabilities scalloped circle die, and cut out patterned paper. EASY layout! It's FRIIIII-DAY! Ask me how excited I am! I have the day off today, and am heading to St. Cloud with friends to stamp the weekend away! So I thought I'd leave you with a bingo card before I head out! I'm making great strides on my stamp room bingo card tree, and I PROMISE to show you the finished project before Christmas! 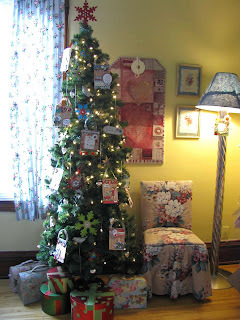 It is coming along nicely, and I've also enlisted the help of a sweet friend who volunteered to help me decorate it! I cannot WAIT to see what she does with the bingo cards I sent her! I've got quite a few of my own done and will post them soon! This one was done last week when I was in paper-piecing mode! 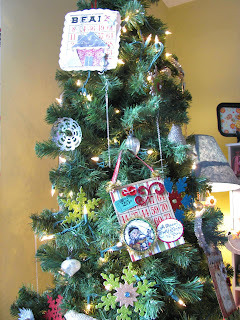 I stamped the ornaments out, then stamped them again on patterned paper, cut them out and layered them onto the white paper ornaments. I colored the point in with warm grey 2 Copic & a Sakura Gelly roll glitter pen to make them silvery. 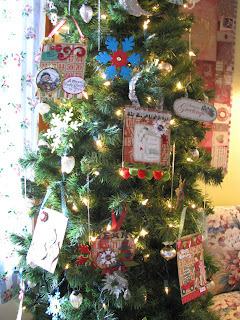 The paper and snowflakes are all by K & Company's Christmas Cheer line, from Michaels (COUPONS, girls, COUPONS!)!!! Okay, this is a shameless plug for Crafty Secrets, but I honestly have to tell you how impressed I always am when Sandy and Cindy from Crafty Secrets show us the new stamp sets. 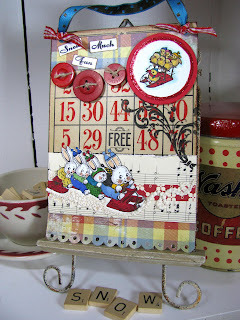 Sandy has such an eye for cute, sweet vintage artwork! Amongst her many talents and generosity, she truly has an eye for heartwarming images! These birdies are no exception! I wish you could be there to hear the squeals when Sandy lets the design team preview the new sets! Many times she'll ask for our opinions and have us help tweak them ahead of time. What captured my heart with this set was not only the cool ornaments with all the accessories and swirls to fit inside, but the 2 sweet birdies that came with it. 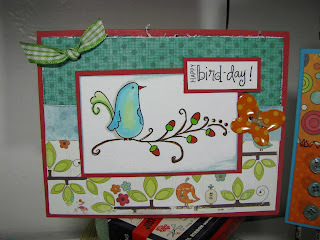 I thought these birdies deserved the spotlight on their own, because they truly can stand alone and make a great card! Here I stamped off a row of them sitting on the holly leaves. This set also comes with some cool branches, so you could create a christmas tree scene or a row of branches for them to sit on! 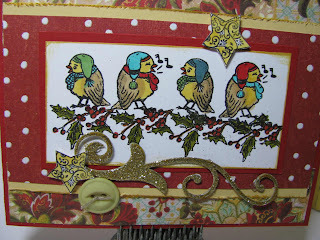 I went with the holly because I wanted the red berries to contrast against the burgundy patterned paper. The set also comes with that cool swirly star, so I cut out a couple of stars for accents. And I'm back on the chipboard swirl kick; this time I colored it yellow and glittered it up with Martha Stewart yellow gold glitter. Copic colors: Buttercup yellow, light camel, mint blue, spring dim green, sanguine & abyss green. What's today, Wednesday? I'm losing track of time this week! Happy Wednesday, all!